Secondary Schools. Candidates have to submit applications through online only, by hand applications are not received. Applications to be submitted online via Zilla Panchayat Office Kondagaon website of Cgvyapam.choice.gov.in on before closing hours on 12-08-2017. 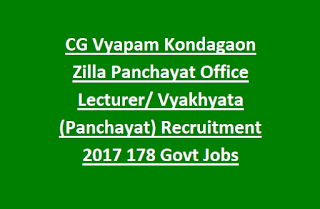 There are total 178 vacancies available in this Kondagaon Zilla recruitment of Lecturer (Panchayat). 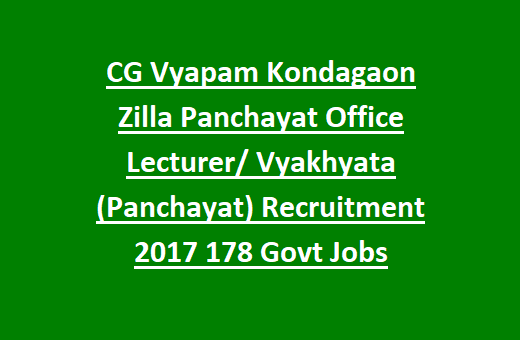 Complete details regarding Vyakhyata/Lecturer Recruitment of Kondagaon Zilla details are given below. There are total 178 vacancies available in total 7 subjects. Subject wise Panchayat/Lecturer vacancies are given below. First preference will be given to Post Graduation having candidates and experience candidates. As on 01-07-2017 candidates minimum age limit is 21 years and maximum age limit is 35 years. For female, PH and reserved category candidates age limits are applicable as per Government of Chhattisgarh norms. Selection for this Lecturer/Vyakhyata recruitment will be conducted based on Marks in Written Test. Written test will be objective type and 100 questions will be given. For each question one mark will be given.. Application form available in the official website of Zilla Panchayat office of Kondagaon @kondagaon.gov.in. The candidates have to download the application form in A4 size paper only. On cover letter clearly mention the post name for which post you are applying and write the Community details. Filled application along with all necessary certificates must have reach the given address "Chief Operations Officer, Kondagaon Zilla Panchayat Office" through Ordinary Post/Speed Post only before 05:00 PM on date 20-06-2016. Along with applications form send the all self attested copies of educational certificates, experience certificate if any and community certificate, date of birth certificate and any other related documents. And also send the two self addressed cover letters with Rs.5 stamp each with the application form. Download application form here for Kondagaon Lecturer Panchayat Recruitment 2016. Please share this Kondagaon Zilla Lecturer Recruitment details with your beloved friends through social media.